South Africa’s plan to change its tax law to ensure digital companies such as Google and Facebook contribute to the government’s coffer could raise up to R4.4 billion a year. This is money that could give a life line to the ailing local media. The introduction of the new legislation will force local vendors doing business with Google, Facebook and other tech giants to pay value added tax (VAT) on goods and services purchased. The law will come into effect on 1 October 2018, according to a draft memo by the National Treasury. It is unclear how much money South Africa has lost in tax avoidance by the digital giants, but auditing company PriceWaterhouseCoopers said in a 2016 report that the government had missed an opportunity to levy a corporate income tax on foreign digital companies, particularly as the South African Revenue Services (Sars) has missed its revenue collection target in recent years. PwC’s research shows that digital advertising on platforms such as Google and Facebook is the fastest growing area of revenue in the entertainment and media sector in the country. In 2016, year-on-year media and entertainment revenue growth hit 10.7% in South Africa, with digital revenue, mostly taken by Facebook and Google, raking R46.7 billion. By 2021, total entertainment and media revenue is forecast to reach R177.9 billion from R132.7 billion in 2016. Digital is expected to account for R77.4 billion. Google and Facebook’s tax avoidance is not just a headache for South African lawmakers, but has become an increasingly pressing topic for the local media and publishing industry, for the Organisation for Economic Co-operation and Development (OECD), and the European Union. These European entities are trying to tighten the loopholes around tax laws which allow Google and Facebook and other internet companies such as Amazon and Netflix to avoid paying the tax rates applicable to the countries in which they operate in and generate value. At the heart of the issue is the way tax systems around the world, including South Africa, have been established. They require a Permanent Establishment (PE) or a fixed place of business which gives rise to income or VAT liability in a particular jurisdiction. Digital giants have designed complex tax systems in multi-jurisdictions that makes it difficult for the authorities to regulate and for the public to understand. Facebook however, is on a mission to show it is complying with the local tax regime. David Wehner, chief financial officer at Facebook said via email the social networking giant is moving to a local selling structure in countries where it has an office to support sales to local advertisers through 2018, with the aim of completing all offices by the first half of 2019. “In simple terms, this means that advertising revenue supported by our local teams will no longer be recorded by our international headquarters in Dublin, but will instead be recorded by our local company in that country,” said Wehner. “We believe that moving to a local selling structure will provide more transparency to governments and policy makers around the world who have called for greater visibility over the revenue associated with locally-supported sales in their countries,” Wehner added. Some tech giants make use of the ‘Double Irish with a Dutch Sandwich’ tax avoidance scheme to route profits to low or no tax jurisdictions. The technique involves sending profits to one Irish company, then to a Dutch company and finally to a second Irish firm established in a tax haven such as Mauritius. Ireland came under significant pressure from developed countries about this tax practice and in 2015 passed measures to close the loopholes which will end the use of this scheme. Companies who already have structures will continue to benefit from the old system until 2020. So far he said, he has not seen the Sars audit any of the technical giants operating in the country as it is still early days and government employees do not have the required skills yet. South Africa’s corporate tax rate applicable to local companies is currently 28% with an additional ‘Secondary Tax on Companies’ at 12.5% on any net dividends declared. Charles de Wet, Head of Indirect Tax for PwC Africa urged South Africa’s tax authorities to implement both VAT and corporate tax on e-services. “Such measures would be a welcome expansion to South Africa’s tax base, and better align our tax system to those of more developed countries,” he said. “These measures would also present an opportunity to better protect local industry against larger multinationals by ensuring a more level playing field,” de Wet added. 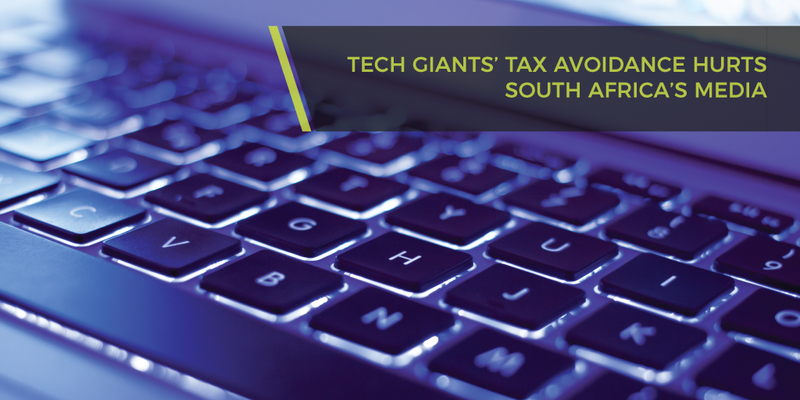 South Africa’s Davis Tax Committee found multinational tech companies are able to avoid tax because the originating cause of their income and their servers are not based in the country. However, it recommended SA to wait for the EU and OECD to develop regulations, as going after the digital companies as a small, middle income country alone will be difficult. Currently, in most countries in the world, electronic advertising supplied from foreign entities is not subject to VAT or corporate income tax. Facebook and Google take in 84% of all global advertising revenue (excluding China), according to a report by media buying agency GroupM, causing “disastrous” effects on the South African media and publishing industry. A report by the University of the Witwatersrand on the State of the Newsroom 2015/2016 found that over 1000 journalism jobs had been cut between 2012 and 2015 while newspaper circulation continued to slide. Anton Harber, professor of journalism and media studies from the same university said there has been a two-stage decline in newsrooms: The shrinking of newsrooms to deal with declining traditional audiences and the shift to online. This medium however, has not produced the revenues to sustain journalism. South Africa might have gotten off to a slow start but the noose appears to increasingly tightening around digital companies trying to avoid the tax net. If publishing companies and journalists believe there is enough public interest in having a well-resourced media which is able to tell stories through a local lens, they could make a case to government to follow international precedent and consider forcing e-giants to provide a revenue stream to support local news.